The Western Cape Provincial Parliament’s Standing Committee on Community Development (Health portfolio) will conduct a public hearing on the National Public Health Institute of South Africa Bill [B 16B-2017] (NCOP). The purpose of the Bill is to provide for the establishment of the National Public Health Institute of South Africa in order to coordinate, and where appropriate to conduct, disease and injury surveillance; to provide for specialised public health services, public health interventions, training and research directed towards the major health challenges affecting the population of the Republic; and to provide for matters connected therewith. 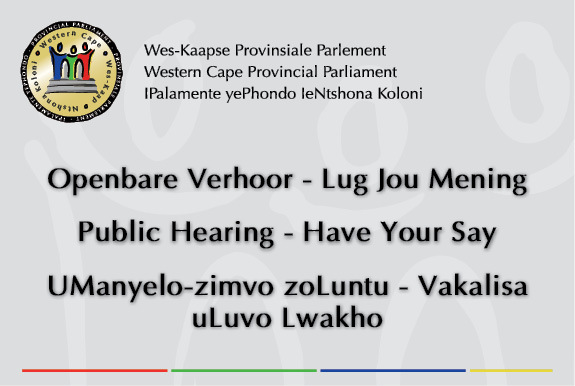 The public hearing is in line with the public participation process in accordance with Section 118 of the Constitution of the Republic of South Africa and the Western Cape Provincial Parliament Standing Rules. Interested persons and organisations are encouraged to attend and to participate in the public hearings and to make any written submission on the Bill to the Standing Committee for consideration. Only input on the content of the Bill will be considered. Please indicate whether a verbal presentation on the written submission will be made. Written submissions must reach the Committee Coordinator, Ms N Jamce, in the Committee Section, Fourth Floor, Western Cape Provincial Legislature building, 7 Wale Street, Cape Town, by Friday 16 November 2018. Ms Jamce’s contact details are: tel: 021 487 1658 and email: njamce@wcpp.gov.za. Copies of the bill available for download here.